Most people consider liver the most palatable of the "nasty bits," a foodie's term of endearment for offal, or organ meats. Although it's safe to eat the liver of most food-producing animals, one guideline applies to all: the younger, the better. No matter how young, though, liver has a musky, metallic flavor. That's why most recipes have you dredge liver in flour before frying it. Flour adds a nutty flavor and helps the brown the liver, qualities also attained by frying it with onions at a higher temperature than usual. Rinse the liver in a colander under cool, running water. Trim off all the visible fat, veins and membranes from the liver with a paring knife. Loosen the veins by inserting the tip of the knife under them and prying them up. Cut the liver into strips. Place the strips in a bowl of milk and soak them for about 30 minutes. Soaking liver in milk removes any traces of blood and impurities. Remove the liver strips from the bowl and rinse off the milk. Pat them dry with paper towels. Slice one large onion for every 8 to 10 ounces of liver into slivers about the same width as the liver. Heat a scant amount of high-heat oil in a saute pan or wok over high heat for about four or five minutes. Canola, peanut and sunflower oil all tolerate high heat without smoking. Season the liver strips on both sides to taste and lower them in the hot oil. Saute the liver until it's dark, golden brown on the outside, or for about two minutes total. Stir the liver frequently so it cooks evenly. The inside of the liver should be supple and pink for the best taste and texture. Remove the liver from the pan and place it on a plate. Add the sliced onions to the pan and saute them, stirring frequently, until golden brown and soft, or for about five minutes. Add the liver back to the pan and turn off the heat. Toss the liver and onions together and serve. 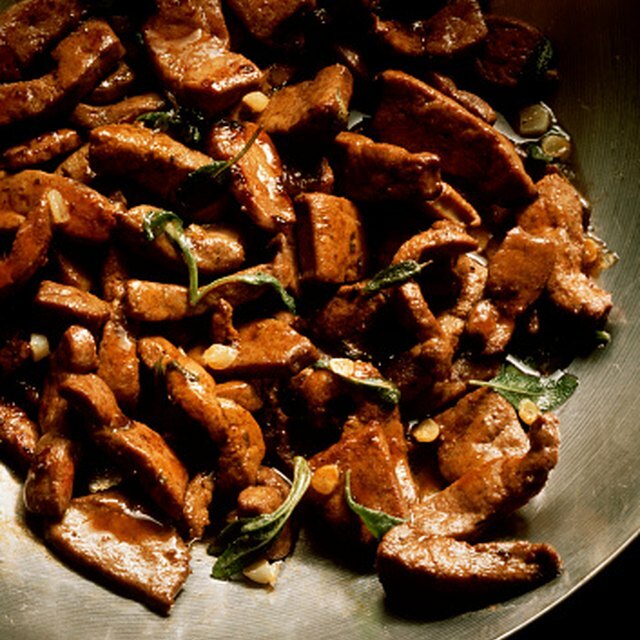 The U.S. Department of Agriculture recommends cooking liver to the following internal temperatures: beef and veal, 160 degrees Fahrenheit; pork, 160 F; chicken and duck, 165 F; lamb, 160 F.